Winkie was born in Myanmar (formerly Burma) in 1966. When she was still a calf, she was captured and sold into the exotic animal trade, which brought her to the Henry Vilas Zoo in Madison, WI. In September 2000, Winkie arrived at The Sanctuary as its 7th resident. In addition to an individualized diet, a sand stall has been installed in Asia Barn for Winkie’s comfort. Veterinary and Husbandry staff learned from Billie and Rosie that the addition of a sand stall can make a huge difference for an elephant in terms of their comfort and ability to lie down to rest. Sand is a great substrate for elephants because it cushions their feet and distributes their weight. A pile of sand also creates an incline that makes it easier for an elephant with arthritis to lie down and get up. Since her retirement in 2000, Winkie has grown increasingly social with the Asia herd and ventures farther and farther into the habitat. Now at 51-years-old, Winkie is showing signs of several chronic, progressive health conditions common in aging, captive elephants. In September 2000, Winkie arrived at The Sanctuary as its 7th resident. Sissy, having arrived just a few months prior, quickly became her closest companion. 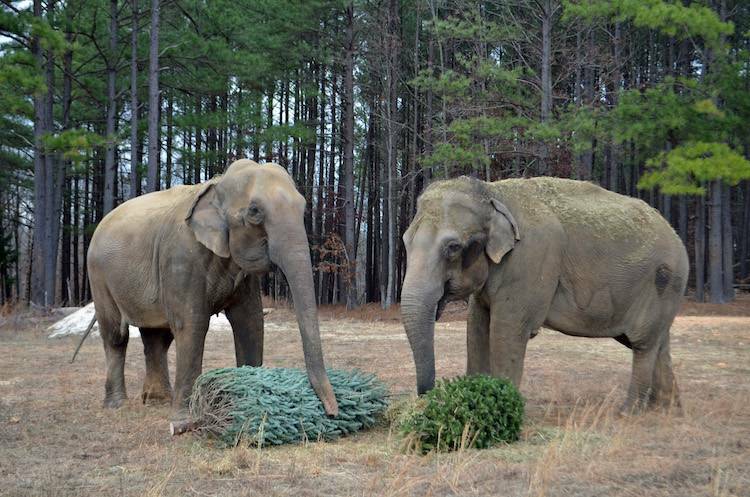 Both elephants came to The Sanctuary with a reputation of being anti-social, but they seemed to be a perfect fit for one another. Over the years, Winkie has become more social with the rest of the Asia herd, venturing farther and farther into the habitat. At 51-years-old, Winkie is showing signs of several chronic, progressive health conditions common in aging, captive elephants including kidney disease, degenerative joint disease, and foot abscesses. The Sanctuary’s Veterinarians and Husbandry Staff are monitoring Winkie closely, and have created a personalized care plan for Winkie that includes a tailor-made diet for kidney health that suits both her needs and palate. Because Winkie has developed many environmental and food allergies, The Sanctuary’s Veterinary Team is also consulting with a nutritionist specializing in elephant diets to ensure that, as a large herbivore with dietary restrictions, Winkie has a balanced diet and is able to get the proper number of calories. She is showing a special interest in oats, barley, and beet pulp and has been enjoying donated bamboo and grapevines. Care Staff are pleased to note that in last few weeks Winkie’s appetite has improved and she has gained over 200 pounds. Although Care Staff are looking forward to seeing Winkie sleeping in her stall, they say for now, she seems to enjoy turning and tossing the sand with her trunk. Care Staff are hopeful that once Winkie adjusts to this new set up, she’ll begin to lie down on the soft surface. Winkie continues to spend time out in the habitat and enjoys interacting with her habitat mates.